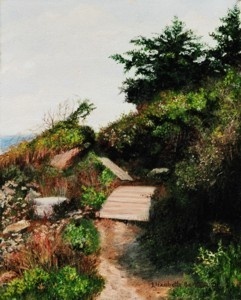 Another in the series of path pictures from Gonzaga at Easternpoint, Gloucester, MA. The idea was to inspire the viewer to enter the path and discover on their own what may lie ahead beyond their view. It was as exciting to paint as it was to explore.